"I must say that I had no special expectations since this is the first such a meaningful meeting, and, in my opinion, it was originally supposed to be a sort of a warm-up so that later on, in the course of our future contacts, we could speak more substantively," Putin said in an interview with Russia's Channel One television following talks with Trump in the Finnish capital of Helsinki. "But it turned out quite differently, the talks were really very substantial, "Putin stressed. He added that the conversation with Trump "was, indeed, indeed, very friendly." Vladimir Putin also said that Donald Trump is a very professional person, who is capable to listen to other people and understand their arguments, however, the US leader keeps his own opinion on many issues. "He is a very professional person with knowledge of the matter, he listens to and understands arguments. On some issues he keeps his own opinion, including on [the Joint Comprehensive Plan of Action on Iran's nuclear problem] as I have already mentioned… I can tell you that everyone considers him to be solely a businessman, I think it is not like this. Because, after all, he has already become a politician as he can listen and hear what the voter, the population, wants from him. And he is good at doing this," Vladimir Putin said in an interview. Moreover, Russian President said Monday he discussed during his meeting with US President in Helsinki all issues that had been prepared in advance by their aides. "We discussed all the issues that I mentioned, agreed to a certain extent on some issues and disagreed on some other issues, but these were all topics that were coordinated in advance by our aides for today's discussion. Nothing was left out," Vladimir Putin said. The US initiative on the Iranian nuclear program should not lead to the destruction of the Iran nuclear deal, known as the Joint Comprehensive Plan of Action (JCPOA), Russian President Vladimir Putin said on Monday. "The United States would like to draw Iran's attention to its resolute policy, to missile programs, but in our view, this should not lead to destruction of the JCPOA," Vladimir Putin stressed. It would be a pity if the JCPOA ceased to exist, vladimir Putin added. "The Russian position remains unchanged regarding the Iranian nuclear program, and we believe that the JCPOA is an instrument that makes it possible to guarantee the non-proliferation of nuclear weapons in general and in the region in particular," the president said. Iran is one of the countries most extensively monitored by the International Atomic Energy Agency (IAEA) today, and it would be a shame if this tool ceased to exist, Vladimir Putin said. Russian President Vladimir Putin also said Monday that he and US President Donald Trump Donald Trump agreed to work out at the level of experts the issue of resolving the crisis in Ukraine. "We talked about Ukraine, there are some new ideas on ways to resolve the crisis in the southeast of the country, and we agreed to work it out at an expert level," Vladimir Putin said. He stressed that this could be a move forward in the settlement of the Ukrainian conflict. Russia and the United States are on the right way to resolve the situation in Syria and even in broader sense, Russian President Vladimir Putin said on Monday. "In general, it seems to me that we are on the right track in terms of resolving the situation in a broader sense, not just a purely Syrian problem," Putin said. "On some issues, as you could see at the press conference, we agreed, in particular, on some issues of settlement in Syria, in particular, in the southern zone of de-escalation, in the Golan Heights, taking into account the interests of Israel. We earlier talked about it with our Iranian partners," the Russian president said. It is vital to create the necessary conditions for the return of refugees to Syria, Putin added. Russia and the United States must take more resolute joint action to address this issue, he noted. The Russian leader recalled that the Syrian authorities and the army now control a territory where more than 90 percent of the population lives. "In order to return many people to their places of permanent residence, we need to create conditions for this. Let's remember that there are more than three million refugees in Turkey and another million in Lebanon. This is the potential for a flow of refugees to Europe, to the United States, to other countries. We must not wait until they move in this direction, we need to create conditions for their return," Vladimir Putin said. The president also noted that for this it is necessary to restore infrastructure and energy supply. "Therefore, we agreed that we will act more resolutely and jointly in this direction," he concluded. Russia is making vigorous attempts to intensify the political dialogue in Syria, Russian President Vladimir Putin said, adding that the Syrian opposition must follow the suit of the country's authorities and create its own part of the constitutional committee that would be engaged in drafting of the constitution. "We are now making energetic attempts to activate this dialogue. We have persuaded the president [of Syria Bashar] Assad to form his part of the constitutional committee, which must deal with drafting the constitution, or adopting a new constitution. President Assad did it, but the opposition has not done it yet," Putin told the Channel One broadcaster. According to the Russian leader, Syria's opposition forces and those who support them should establish their part of the constitutional committee. "The ball is now on the side of the opposition and those who support them. They must at least form their part of this constitutional committee and move further in this direction. There are all conditions for that," Putin added. 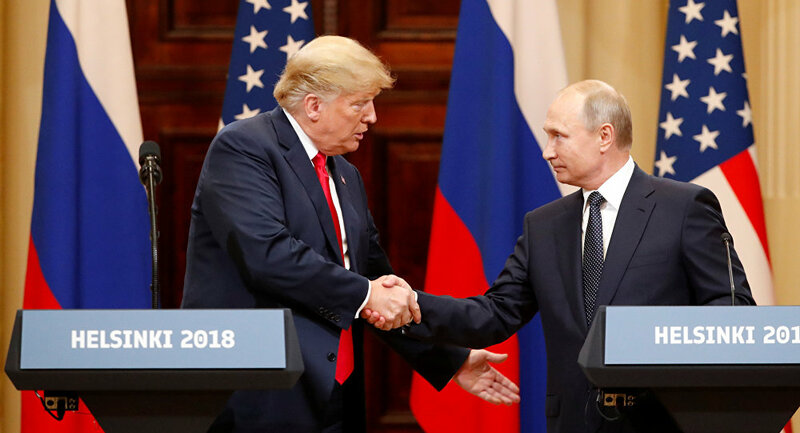 In addition, Russian President Vladimir Putin has said that he might meet with his US counterpart Donald Trump on the sidelines of international summits in Argentina or Asia, however, no concrete dates have been determined yet. "We have not determined the date of the next meeting, but such a meeting is possible on the sidelines of one of the Asian events, and then we might meet at the G20 summit in Argentina," Putin said in an interview with Russia's Channel One television following talks with Trump in the Finnish capital of Helsinki. US President Donald Trump said in a statement on Monday that he has great confidence in his own intelligence people but knows that the United States and Russia need to get along. “I have GREAT confidence in MY intelligence people. However, I also recognize that in order to build a brighter future, we cannot exclusively focus on the past – as the world’s two largest nuclear powers, we must get along!” Trump said in a Twitter message. Trump's statement comes after the US president said during a press conference earlier on Monday that he did not think Russia interfered in the 2016 US election. The statements about election interference contradict an intelligence assessment from January of 2017. Russian officials have strongly denied allegations that Moscow attempted to tamper with the US election campaign and have emphasized that none of the accusations had been backed by evidence.